Hidden defaults setting that forces links that would open in a new window to open in a new tab instead. Should be default behavior. On the stupidity of the publisher’s guild. I can’t imagine that a text-to-speech feature is going to dent the sales of audiobooks. Do we have a bank recovery strategy, or are we just going to keep the zombies going? We are down the rabbit hole. As Dave has written elsewhere, the interests of the shareholders and the public are not in alignment on the bank bailout. Digging into the various theories. The DTD for importing a bug into Bugzilla. Master list of color scheme tools online. A landmark article on phone phreaking, absolutely riveting 38 years later. Investigating low-volume ways to cook pasta. Conclusion: with a little pretreatment, you can cook a pound of pasta in as little as 1.5 quarts of boiling water. John Park continues his transformation from unassuming animator into world dominating celebrity. EMI and Apple monetize the pre-release leak. Kind of brilliant, really. Now that’s a home office. Guess I know what I’m reading next. Ooops. Hope the satellite is recoverable. Let’s be careful out there. It’s a good idea not to open Excel documents from people you don’t know anyway. Too bad it’s Windows only. But LyricWiki looks like a good bet for pop-up free lyrics. Wonder how long it is before they’re C&D’d? How far it’s come. XML Notepad was a top search term on Microsoft.com while I was there. It was a sample project that was hosted for a while on MSDN, then went away, and people went nuts trying to find it again. I guess someone noticed. It’s a nice little XML editor. This is positive. Ever since the first BloggerCon I’ve been feeling the gap between truly participatory conferences and “wisdom receiving” conferences. I can’t go to too many Gartner conferences for this reason. I think if more speakers thought about the backchannel as a positive force for their sessions they’d embrace it. Like the Darden professor quoted, I’m puzzled. What kind of business school has cheatable exams? Profile of Rahm Emanuel. Interesting counterbalance to the prevailing media portrait of Rahm as nothing but a profane fixer. I got an email from someone the other day asking about one of my ancestors (Andrew Hershey, 1702-1792). I get this sort of email all the time, since my family tree is online, and normally I’d have looked up the answer to the questions and emailed back. The problem was, I was on my iPhone and didn’t have access to my detailed genealogy research. 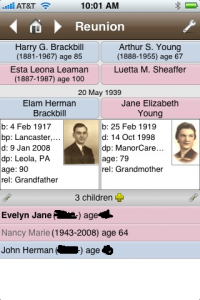 I found myself thinking, I wonder if there’s a good genealogy app for the iPhone. Maybe something that will read my GEDCOM export and display it nicely. It would be really great if Reunion were on my phone, though. So I hit the app store, and the first app in the search results for genealogy was … Reunion! Leister Pro has done an iPhone client that allows you to bring your genealogy data with you, and sync it back to your Mac when you’re done… sort of. I have about 4000 records in my family data, and opening and browsing it is quick and painless. The UI is splendid, taking all the best parts of the Reunion “family card” display and porting them painlessly to the iPhone. Images are supported, and the experience is almost like sitting in front of my Mac. There was one glitch I encountered–somehow my sources data didn’t seem to move from my Mac, something I’ll need to investigate further–and two missing features. On the iPhone it would seem natural to provide the ability to add a photo from the phone’s photo list or from the built-in camera to an entry; neither is currently supported. And the app relies on a Bonjour based syncing strategy — turn on your phone, click a button on your Mac, and the syncing happens over your WiFi network — that happens separately from the phone’s main sync loop. Based on your opinion of iPhone syncing, this may be a good or bad thing, but surely there are other sync methods available that wouldn’t require a separate action. Right now these are quibbles–I’m generally very pleased with the app, and thrilled Ididn’t have to find a new genealogy app just for the iPhone. RSS hits the big time. The community comes to the rescue with a plug-in to reenable Hulu on Boxee. Detailed thoughts on the BSO recording announcement. The BSO announced yesterday that it was kicking off a series of recordings on its own BSO Classics label. I’m on three out of the four initial recordings as a member of the Tanglewood Festival Chorus: the Brahms Requiem, Bolcom Symphony No. 8, and Ravel’s Daphnis et Chloé. The recordings are available at the BSO’s download store now and will be on iTunes and other services next month. As any observer of the classical music portion of the recording industry knows, it’s a rough time for classical recordings. The bigs aren’t doing much symphonic music any more, partly owing to fees owed to players unions (though some, like Philadelphia, appear to be working around that with revenue sharing agreements). So the prospect of an orchestra entirely self-releasing its own material is interesting, to say the least. It will be interesting to see which way the BSO’s hedged bet on digital only releases (two of the recordings are also available on CD) will go. I’m on three of the four recordings–Bolcom, Brahms, and Ravel. Excited to hear they’ll be on iTunes in March. Informed speculation on the deal that cut off Hulu on Boxee. It sounds all too likely. On the irrational religion of tax cuts. Greg Raiz is a superb designer (Microsoft Windows XP theming and user experience, some work for iET Solutions). He has some good points about the design of the Kindle, but I think his revisions only go partway there. Stealth attack kit for Mac targets the application memory space and leaves no traces. Exploits the weaknesses in Mac OS X’s address space randomization. Again–secure the apps. They are currently the weakest point in anyone’s infrastructure. I’ve started digitizing some old photo albums. Nothing earth-shattering: these were photos I took as a kid with my first camera, starting in 1981 or 1982 through about high school. But some of the photos are interesting to me because they frame the way I think about some physical realities now–like my uncle’s house in Vienna, Virginia, or the land where my parents’ house is now on the old family farm. The photoset has started on Flickr; I’ll be adding more over the next few days. One of the photo sets in particular is fascinating to me: a series of photos from my grandfather’s 65th birthday, circa February 4, 1982. I had only had the camera a month or two so didn’t know anything about taking pictures (as if I do now), but I worked my way around and got pictures of that whole kitchen, along with pictures of just about everyone in the family. 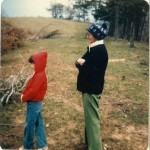 And then there’s the photo on this post, of my sister and my Grandmother Jarrett. I think when I was a kid that I always thought my grandmother was old–she was older than my Brackbill grandparents by quite a few years–but now when I look at that photo I realize that she was younger than my inlaws are now. Seeing it through the faded photographs, I feel older than I am. Sheath for a toy sword: I had a cheapo plastic toy sword which glowed in the dark, so it became both a medieval sword and a lightsaber. Since it wasn’t a real lightsaber, it needed someplace to stay when I wasn’t posing like Luke Skywalker, so I built a simple sheath for it. You can see the basic symmetry of the Ramagon toys in the photo: they did pyramidal very well, and it was easy to link them together into a strong boxlike structure. Holster for a toy gun: Just as the Ramagon hubs could do pyramids, it was trivially simple to make cubes with them. Add a pyramid at the end to taper the gizmo, extend one end with a square for a belt loop, and cover the frame with the plastic snap-in panels, and presto: very uncomfortable and big holster. There’s a very cringe inducing “action shot” of the holster and the sheath on Flickr; in my defense, it was 1982. Toy gun: This was the coolest of the three toys, and I’m sorry I don’t have a better picture. A combination of a long hex frame and some closely snapped together hubs, and the illustration shows the short connectors (the black piece here used for the “trigger” and to secure the close clusters at the end of the gun) that I had forgotten existed. “Action shot” here (not me in the picture). Please, rich people, spend us out of this mess! In other words–endpoint and application security are where we should be spending our time, not redesigning the core protocols. Nice way to de-dupe dynamic content on the web: link rel=”canonical”. And there’s a WordPress plug-in. My reading: The New Yorker joins the rest of the world in projecting a post-inaugural letdown onto poor Shepard Fairey for his creation of the Obama Hope poster.